This scrapbook of a creative life intertwines photos, poems, and vignettes to capture distinct memories. 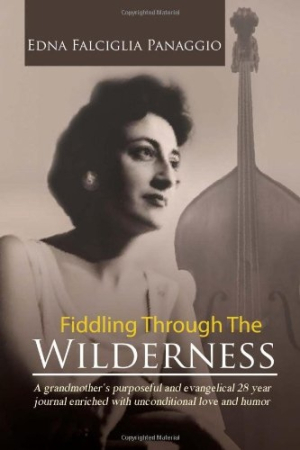 Fervent Christianity and complex relationships formed throughout a lifetime of creativity are explored in Edna Falciglia Panaggio’s memoir, Fiddling through the Wilderness. For those who are familiar with the context of Panaggio’s life, it is likely a valuable record of her proudest and most influential moments. Without that context, it can be difficult to follow. This is a collection of memories, poems, and photographs. Although the cover declares that it is a “28 year journal,” Panaggio traverses far more than twenty-eight years. Reading like a scrapbook, it is not organized chronologically and is often confusing, as memories are discussed without any context. For instance, the first chapter mentions Panaggio’s husband, and the next chapter begins with her severing a relationship with someone named Gus; it is unclear which relationship occurred first. The early chapters are easier to follow than the latter ones, which are chopped into brief memories, poems, unlabeled photographs, and references to the extensive epilogue. The poems are simple and lyrical, though they aren’t effectively woven into her story. Most of the passages are focused on Panaggio’s encounters with friends and family and successes of her professional acting career. The eighth chapter, “On the Set as an Extra,” is a collection of fleeting encounters with big names from Hollywood. But being brushed off by Steven Spielberg or having Gregory Peck use the same restroom comes off as mere name-dropping. These stories are brief and tell us little about the people outside of the fact that she met them. The text is heavy with strong religious opinions. There are frequent references to Panaggio’s artistic life, but, mysteriously, she is never fiddling, despite the cover and title suggesting otherwise. Fiddling through the Wilderness is a small book, but one filled with many distinct moments in one woman’s life.